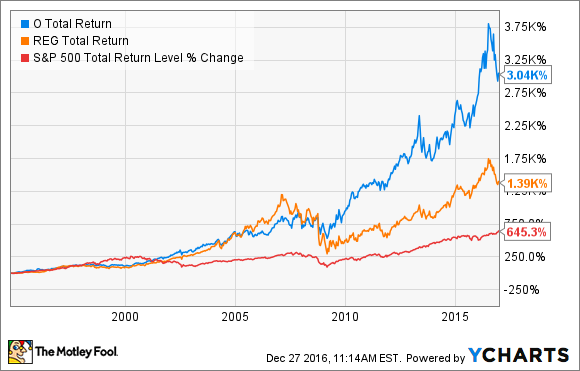 Which of these two dividend stocks is the better long-term bet? There are several reasons to like retail-focused real estate investment trusts (REITs) as long-term investments, such as low turnover and leases that require tenants to cover the variable expenses of property ownership. However, there are several different types of retail real estate, so with that in mind, let's look at freestanding retail giant Realty Income (NYSE:O) and shopping center REIT Regency Centers (NASDAQ:REG) to see which is the more attractive buy now. Which is the better stock to grow your wealth? Image source: Getty Images. This makes most of Realty Income's tenants recession-resistant and/or immune to competition from online retailers. The company's tenants sign long-term "net" leases with 15-20 year initial terms, and annual rent increases built in. As I write this, Realty Income's portfolio contains about 4,600 properties spread across the U.S. and Puerto Rico, and the portfolio is 98% occupied. Regency Centers, on the other hand, invests in shopping centers, particularly those anchored by grocery stores. As in Realty Income's case, the majority of Regency Centers' tenants are engaged in internet-resistant and non-discretionary business. As of the most recent quarterly report, Regency Centers owns 307 properties but is in the process of merging with Equity One (NYSE:EQY), which will give it a larger portfolio of 429 properties and make it the largest shopping center REIT in the market. About 80% of the combined company's properties will be anchored by top national grocery brands including Kroger, Albertsons, and Publix, and the combined occupancy rate of both companies is currently 95.8% -- giving a slight but significant advantage to Realty Income. In a nutshell, both companies focus on retail properties that can thrive in the growing world of e-commerce and that can withstand any adverse economic conditions. Both companies maintain strong balance sheets. As of the latest quarter, Regency Centers has a debt-to-EBITDA ratio of 4.4 (lower is better) and a fixed-charge coverage ratio of 3.2 (higher is better). Once the company is combined with Equity One, these figures will change to 4.8 and 4.1, respectively. The debt level will represent 31.1% of the combined company's gross assets. Realty Income also has a 4.1 fixed-charge coverage ratio, but its debt makes up only 23% of its total capitalization as of the most recent quarter. Regency Centers has delivered annualized returns of 12.5% since its 1993 IPO. This is certainly a respectable track record, as it beats the REIT average of 11.1% and handily surpasses the S&P 500's 9% total returns over that time period. O Total Return Price data by YCharts. What's more, Realty Income has increased its dividend for 77 consecutive quarters at an average annualized rate of 4.6%. In contrast, Regency has increased its dividend for three years in a row, and had to make a big cut in the wake of the financial crisis. And don't forget that Realty Income yields 4.3%, while Regency Centers pays out just 3% as of this writing. The best way to measure REIT earnings is through funds from operations, or FFO. This is an accurate way to measure how much each REIT earns, which translates to its ability to pay dividends to shareholders. Core, or adjusted, FFO is better yet, as it is a company-specific method of reporting earnings that takes one-time items into account. With that in mind, Realty Income trades for 19.6 times the midpoint of its 2016 full-year core FFO guidance range. Surprisingly, Regency Centers trades for a higher multiple of 20.7 times its 2016 core FFO projections. I have to call Realty Income the more attractive stock right now. Nothing against Regency Centers -- the company has a solid history of returns, and I believe that its business model should allow it to absorb any recession-related effects and avoid losing tenants to internet-based retail competition. However, in every category, Realty Income looks more appealing to me -- which is probably why the stock is a cornerstone of my own retirement portfolio. More of the company's properties are in the "safe" categories, occupancy is consistently higher than Regency's, debt is lower, the performance history is better, the dividend is higher, and the stock trades at a cheaper valuation. In a nutshell, it's the better long-term buy right now.